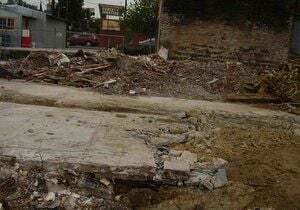 The original home of A Different Light, a pioneering gay bookstore, was demolished on Saturday even after a developer had vowed to leave the Silver Lake building alone until further community meetings could be held, according to city and neighborhood council officials. There were plans in the works to nominate the building at Santa Monica and Sunset Boulevard as a cultural historic landmark and perhaps preserve portions of the facade for inclusion in a new housing development, said Elizabeth Bougart-Sharkov, who heads the Silver Lake Neighborhood Council’s Urban Design & Preservation Committee. In fact, during an Aug.. 24 meeting , an official with Frost/Chaddock Developers said there was no talk of demolition, according to Bougart-Sharkov, who attended the meeting along with Council District 13 staff. On that same day, however, city records show that a demolition permit was pulled for the building. Bougart-Sharkov found out about the demolition permit on Saturday after a bulldozer had leveled the Tud0r-style storefronts, most recently the home to several Sunset Junction boutiques. The demolition crew was finishing up the job by the time Bougart-Sharkov arrived on the block on Saturday afternoon. “They were just piling up the debris,” she said. The Eastsider has contacted Matt Levy with Frost/Chaddock for comment. A Different Light, which eventually became a chain of gay bookstores, opened the Sunset Junction store in 1979 as Silver Lake attracted more gay residents and businesses. The store closed in 1992. “There was a lot of historic significance” to the building, Bougart-Sharkov said.